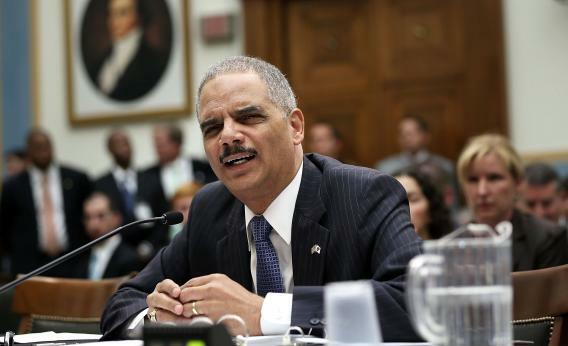 Eric Holder vs. Darrell Issa: Showdown at House Judiciary Committee hearing. Eric Holder Didn’t Put Everything About His Recusal in Writing, and Republicans See An Opening. U.S. Attorney General Eric Holder testifies during a hearing before the House Judiciary Committee on Oversight on May 15, 2013 in Washington, DC. After a few rounds of questioning—so exciting that several members not even on the House Judiciary Committee stopped by to watch—Republicans thought they’d found a chink in Eric Holder’s armor. Holder kept explaining that he couldn’t answer basically anything about the AP subpoenas story because he’d recused himself and handed the investigation to US attorneys. Those subpoenas, said Holder, were approved by a deputy attorney general. Republicans dug in, asking whether Holder had written anything specific to delegate his authority. Holder said he hadn’t. “I would have told the deputy attorney general, as I have done in other matters,” said Holder. “I certainly recused myself before the subpoenas were issued. This dispute goes to the independent counsel statute, revised in 2012. Notwithstanding any other provision of law, an independent counsel appointed under this chapter shall have, with respect to all matters in such independent counsel’s prosecutorial jurisdiction established under this chapter, full power and independent authority to exercise all investigative and prosecutorial functions and powers of the Department of Justice, the Attorney General, and any other officer or employee of the Department of Justice, except that the Attorney General shall exercise direction or control as to those matters that specifically require the Attorney General’s personal action under section 2516 of title 18. That code designates what powers are available to “the Attorney General, Deputy Attorney General, Associate Attorney General, or any Assistant Attorney General, any acting Assistant Attorney General, or any Deputy Assistant Attorney General or acting Deputy Assistant Attorney General in the Criminal Division or National Security Division specially designated by the Attorney General.” BuzzFeed’s @nycsouthpaw helpfully highlighted the key section of the code governing subpoenas. Before personally making any other determination under this chapter with respect to information received under this chapter, the Attorney General shall determine under paragraph (1)(B) whether recusal is necessary. The Attorney General shall set forth this determination in writing, identify the facts considered by the Attorney General, and set forth the reasons for the recusal. The Attorney General shall file this determination with any notification or application submitted to the division of the court under this chapter with respect to such information. Holder announced that he was handing the case over to independent prosecutors. He didn’t explicitly say at that moment that he was “recusing himself.” It’s a thin reed, I guess, but it’s a reed.